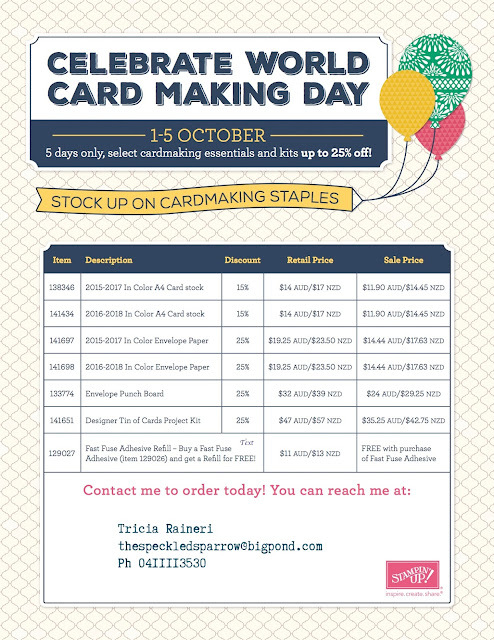 The Speckled Sparrow: Happy World Card Making Day! Happy World Card Making Day! For many of us Aussies, it is also the AFL Grand Final so Happy Grand Final Day to you too! I'm not a football fan so I am sticking with World Card Making Day, especially when Stampin' Up! offer awesome specials to celebrate! I plan on spending my World Card Making Day making up lots of my leftover kits ready to send out to some random people this month. To Celebrate, Stampin' Up! have a select range of products available at discounted prices, available 1st-5th October. I am especially happy to see the Tin of Cards kit in this sale! If you would like to order any of these discounted items head to my online store by clicking through on the images below or send me a message.